Billions of dollars are flowing to public school districts across the country through a federal grant program designed to improve poor schools, yet the methods used to determine eligibility include data that have high margins of error, which appears to have enabled wealthy districts to receive some of this money. Every school district in Fairfield County has been deemed eligible for Title I money over the last two years, according to data from the U.S. Department of Education. Title I money is supposed to be set aside of the most impoverished school districts, yet Fairfield County — one of the most affluent areas in the country — has been benefiting from this grant program. Darien only became eligible for Title I money last year, when the government changed how it determined eligibility. When this change occurred, the number of Darien students estimated as impoverished nearly tripled. To find out which schools should get Title I money, the government uses the Small Area Income and Poverty Estimates program. This process estimates the number of children from 5 to 17 who are in poverty for each school district. To determine this number, the program combines aggregated tax return data, model-based poverty estimates by county, and data from the American Community Survey, which is a function of the U.S. Census Bureau. Survey data were not used prior to 2012 to determine eligibility, according to the education department. After incorporating that data, many more districts have become eligible for Title I money. The change was made to more accurately reflect need, according to Connecticut education officials. Before the survey results were used, its promise as a poverty determination tool was heralded in 2007 [PDF] by Jerry Maples and William Bell from the Statistical Research Division at the census bureau. Data from the American Community Survey “will eventually be a rich source of information about the total number of children and the number of children in poverty at the school district level,” the men wrote in a paper examining poverty among children. However, these data have margins of error that exceed 90% in some cases. This means that the number of children who are actually in poverty could be a fraction of the estimated number. Or, alternatively, it could be nearly double the number provided. Additionally, these data have a 90% degree of certainty, meaning there is a 10% chance the actual poverty figure falls outside that range. In Darien, for example, the survey estimated that there were 546 children under 17 who were living below poverty in 2012. However, there is a margin of error of plus or minus 417 children. The estimated number of children in poverty in town, according to the survey, is 7.4% of the under-17 population. While the survey warns against using survey data with high margins of error to draw conclusions, a thorough examination of documents related to this process did not reveal whether Title I distributions also took this matter into consideration. Jo Ann Webb, a spokesman for the U.S. Department of Education, deferred Title I questions to the state coordinator. Marlene Padernacht, Connecticut’s Title I director, said the federal government makes the determination of how funds are distributed to school districts. Documents appear to show that Padernacht is correct, although states take some money and use it for charter or regional schools that don’t have geographic boundaries that the census observes. Additionally, including the survey data was one of only two changes mentioned by the census bureau in its description of how it allocated Title I funds this past year versus its previous methodology. This change has allowed Darien, and other wealthy school districts, access to Title I money. Under the old methods, Darien was not eligible. David Martens, a school board member, pressed the district administration on the Title I money at a board meeting in early March. “That sounds like someone, someday, is going to change that and say, ‘We made a mistake,’” Martens said, expressing concern that strings could be attached to accepting the money that could not be foreseen. The American Community Survey began taking data in 2005, and increased the number of households it contacted to 3.45 million in 2012, which is roughly 2.6% of all American homes. If that percentage remained consistent in Darien, it would mean the survey contacted 183 homes in town. John Emerson, an associate professor of statistics at Yale University, said this small sampling makes use of this data problematic. Since the survey began, Darien’s poverty figures have steadily increased, though its margin of error has remained between 50 and 90% of the number given. The survey noted that small sample sizes would have larger margins of error, and vice versa. In New York City and Boston, for example, the margins are smaller. In 2012, the margin of error in Boston was 13% of the figure given, and in New York it was 2.5%. Using the survey data, the census bureau estimated that the number of impoverished Darien children between 5 and 17 nearly tripled from 2009 to 2010. The estimated total population for this age group increased by 30% during the same time frame, according to the census bureau. Darien data tell a different story. While the district doesn’t track how many total children between 5 and 17 live in town (some attend private school or are home schooled), enrollment figures showed Darien’s public school population increased by 1.3% from 2009 to 2010. The census bureau estimated Darien’s young population then decreased from 2010 to 2011, but showed its impoverished numbers soared for the second consecutive year. This time, it rose 43% to 386 students. The district’s enrollment figures also showed a decline in students that year, for the first time since 1988. The district also tracks the number of students who receive free and reduced lunch. The number of students from 2010 to 2011 getting free or reduced lunch rose by eight. Additionally, while the number of children receiving free lunch has steadily increased since 2009, it has occupied a similar percentage of the total school population. Reduced lunches have fluctuated during that time, records show. Spending Title I money within the regulation’s parameters has also been difficult for the school district. This is because Darien is not the typical community Title I was intended to target, according to Judith Pandolfo, assistant superintendent. Grant money can be used for special education improvements, but Pandolfo said Darien can only use the money if it benefits all students. A request for clarification on this matter with Wood from the federal education department was again deferred to the state. The district is currently planning on spending this money to improve technology. Darien was initially eligible for nearly $400,000 in Title I money, but will get $245,000, after the state adjusted this amount. New Canaan, by comparison, was eligible for $120,000. Darien’s District Reference Group, which is a grouping of schools that share similar socioeconomic demographics, is the wealthiest in the state. 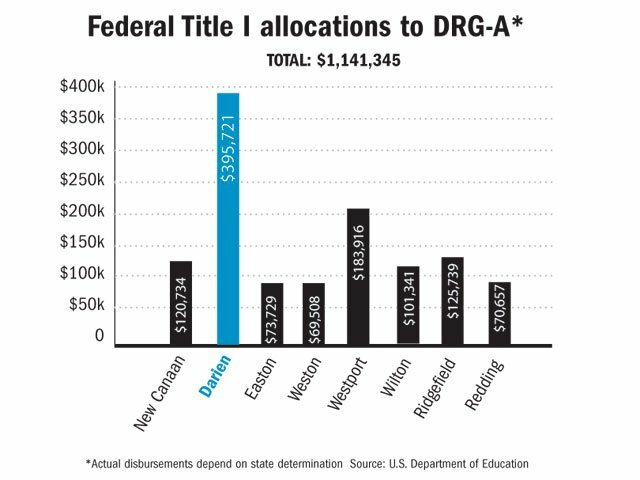 The districts in this DRG were collectively eligible for $1.17 million in Title I money this year. Darien’s allocation was the largest in the DRG, and more than double the next highest town of Ridgefield’s grant. Darien’s social services department has also seen an increase in need from Darien residents, but not on par with data from the federal government. The survey is done randomly each year, so it contacts different people. It’s unclear which Darien addresses have been contacted and which ones responded. Some areas in Darien might be more likely to include people who could be living below the poverty line, however it’s unclear whether the survey targeted these areas or spread a wider net. This entry was posted in Budgets & Spending, Data-driven, Education, Education, Investigative, Investigative, Special Education and tagged American Community Survey, department of education, Small Area Income and Poverty Estimates, Title I, veterans affairs by David DesRoches. Bookmark the permalink.